In the spirit of the upcoming holiday season, and as a present for marketers everywhere, I have curated five research reports filled with trends and data from Cyber Monday last year. 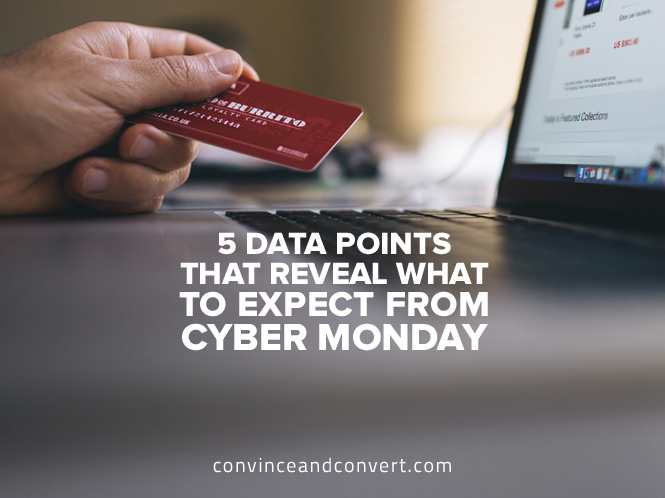 These valuable pieces of research give us five very important takeaways for shaping your marketing for Cyber Monday 2016. As if B2C marketers aren’t scrambling enough right now, these trends and takeaways from last year are so powerful and eye-opening that they may make you want to rethink part of your holiday season plans. Last year, Cyber Monday was the biggest online sales day in US history, with over $3 billion in sales—approximately a 20 percent increase from 2014. Holy smokes! The largest spending demographic was 35–55-year-old females. The average order was $123, down 78 cents from last year. While this amount spent is not a substantial difference, it is interesting that while sales went up, the per-order spend was down. We may want to feature some mid-level cost items and not just high ticket price items. To make sure you’re one of the brands who sees more revenue than last year, consider enlisting the aid of an affiliate program management team, freelancing out a team or individual who specializes in influencer outreach, or increase your spend on gift guide placement. Mobile sales increased over 50 percent from 2014 to 2015. Millennial dads were the biggest mobile shopping group. 36 percent of shoppers say they prefer to use mobile devices for holiday shopping. While I still have a habit of picturing consumers in front of a desktop computer at work or at their desk at home curled up with a cup of coffee, it seems like Cyber Monday for many consumers is mobile. How comfortable are you feeling with your site’s ability to simplify purchasing on an iPhone right now? You might want to quickly reconvene with IT or your web designer to make sure you’re providing easy ways to purchase via smartphone. 43 percent of digital business professionals don’t use any kind of mobile analytics. Less than 50 percent have defined mobile objectives or identified KPIs for mobile strategy. While marketers know how important mobile is to their sites, marketers could gain a lot of insight from analyzing consumer mobile behavior to make sure that they’re ready for this important money-making day. Even smaller and more localized brands can benefit from all the spending on Cyber Monday. By emailing coupons and joining virtual marketing places, brands big and small can capitalize on Cyber Monday. This comprehensive study shows that younger shoppers, who are far more likely to participate in Cyber Monday deals, value and purchase craftier boutique items and support more environmentally and socially responsible brands than any other demographic. 75 percent of shoppers plan to buy from small or local retailers this year, and 33 percent said they will buy a handmade gift this year. Shoppers are on the hunt for small and local businesses, and they’re digitally savvy, so how are you going to reach them? It may not be too late to join local email newsletters and community sites. If you have an email list in place, send them something special on Cyber Monday. If you don’t have the capacity to sell online, consider offering online gift cards for purchase. Get creative, and don’t miss out on the value Cyber Monday can bring to your brand. 80 percent of millennial moms, one of the mightiest purchasing groups out there, avoid traditional advertising and rely on social media, blogs, and consumer reviews to seek out seasonal deals online. Last year 67 percent of shoppers bought a gift they found on social media, and 25 percent of the search engine results when consumers were looking for gifts went to influencer-generated content. You’ve heard it before: Online consumers are ad blind, and they don’t want to hear from the brand on what to buy. They want to hear from their friends both online and offline. Instead, make sure you’re on Cyber Monday gift guides and have partnered with relevant influencers who can talk about your brand to their networks.